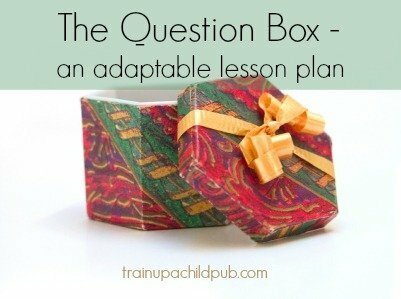 The Question Box – an adaptable lesson plan for any subject! I am not sure where it came from or where it went, to be honest, but we used to have a small, shoebox-sized hexagonal box. It had large red and green paisleys running around the outside and at one time probably held a yummy Christmas gift. We called it “The Question Box.” We study history chronologically and usually used it first thing in the morning as a fun, hands on way to kick off our history study, but it’s an adaptable idea that can be used for almost any subject! After morning devotions, our routine was to head to the schoolroom and start the academic day with the kids taking their turns excitedly pulling a question pertaining to our history study from the box. Here’s how it worked. Customarily, I would make up numbered history and science fill-in-the blank and short answer questions on the computer and print them out, making them different colors. I also made myself a key on a separate sheet of paper. Don’t forget that! We would have a new boxful at the beginning of every history unit, and a big box full of new questions was always something my kids looked forward to! But they had fun guessing and, at the same time, became more interested in what they would be learning. As we progressed through the unit, they were jazzed about how they were getting more and more of the questions right, and how I had to throw in some harder questions just to keep things interesting. By the end of the unit period they usually had all of the questions, even the hard ones, answered correctly. We also had contests and sometimes received prizes (like a piece of gum or an M&M) for answering, for example, three questions in a row correctly. Kids could pull a ‘seat work’ assignment out of the box, such as a verse to copy or memorize, a sentence with errors to edit, a short word problem to figure out, etc. Even household chores for that day could be chosen from a box! As I have been slowly cleaning my way through the school room recently, I came across some of our Middle Ages questions that would be appropriate for late Primary, Intermediate or early Preparatory students. The last five or so would be suitable for Preparatory and/or Secondary students. Please feel free to use these questions in your school, and have fun making up some of your own! If you would like to have these Middle Ages questions and answers in a printable format, click here. Print them and then tell me in the comments how using this lesson plan worked out for you! I like the mystery behind an idea like this. Thanks for sharing. We also have a similar box. We call it our “PE” box. It is full of multicolored slips of paper, each having a physical activity or sports question which would need to be researched to answer. This way my daughter can simply pick a slip and know what to do for her gym class. We do races, exercises, physical activities and challenges such as carrying a ball on her head while walking 5 feet (no hands), jump rope for 30 times without a miss, tree climbing, balancing on a 2×4 on the ground and walking quickly from one end to the other, running backwards, or maybe researching the rules for volleyball which she then may narrate to me (using the chalkboard if applicable). We really had fun with it, Shelly. The kids loved it!